June is Drink Local month! Rounding out our trilogy of theme months, we’re pleased to announce that June will be ‘Drink Local’ month! 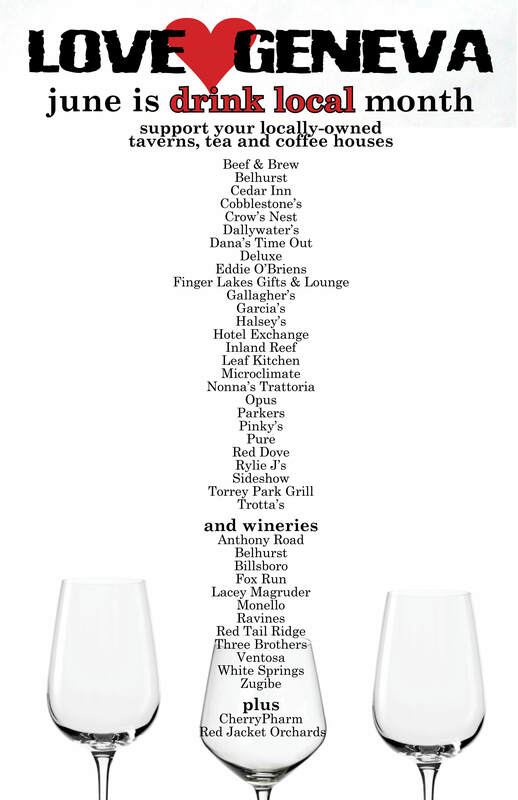 The Finger Lakes region is blessed with a large number of high quality wineries, and Geneva is home to many of these locally-owned industries. Not only does the local wine industry produce excellent wines, it is also an important element for tourism to the region. But Geneva doesn’t just produce wine, we also have the some of the best juice manufacturers in the country (in our humble opinion) with Red Jacket Orchards and CherryPharm. Plus, we have over two dozen locally-owned taverns, tea- and coffee-houses, each of which is a valuable member of our community. So during the month of June, make sure you support the local economy by drinking local. Whether it is where you drink or what you drink, keep on Loving Geneva!